> Your submission(s) can be one or more of the following: Cosmetic Item, Weapon, Taunt, Unusual Effect or Killstreak Effect. > There is no limit on the number of entries you may submit, regardless of type. > This project is not for robotic recreations of items like Robotic Boogaloo, although this is flexible for weapons. > Ensure all cosmetics are imported and Gold-Starred, and all other submissions work properly in-game. > Providing a mod for a submission is optional, but encouraged. Check mods.tf for more information. > You can use a variety of themes for sets, but make sure they either use plenty of metal or technological bits, or feel generally robotic. > You can create items made from robot parts, things inspired by robots or just straight up strap a robot to your back! > Some themes we recommend exploring: Futuristic, Wasteland, Steampunk, Technical gadgets, Mechanic sets, etc! > Follow the style of in-game robotic items when modeling and texturing your items (Wear and tear, large brush strokes). > To submit please upload to the Workshop with the provided thumbnail template. You may change the color of the template as needed to match your item. > You can find the thumbnail template here. > If you would like to join the contest on Facepunch on top of being a part of the project, please email the completed submission to irongauntletmvm@gmail.com. The zip should be named with the usernames of the contributors and the name of the item (e.g. Gauntlet_SedimentarySocks). > Entries created before November 1st are not eligible for the contest. Although, remakes of existing items will be considered if they are different enough. > The deadline for both the contest and submitting items to the workshop is the 31st of January. Please submit all items to the Workshop using the thumbnail template by that time. Team Fortress, the Team Fortress logo are trademarks and/or registered trademarks of Valve Corporation. 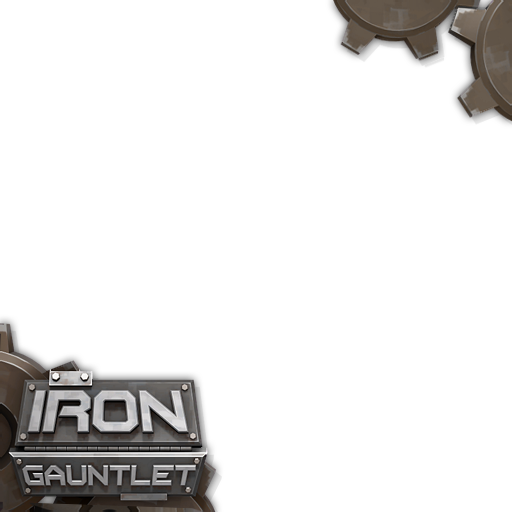 Iron Gauntlet is not affiliated with Valve.